The Benetti FB 230 "Jo" was born on the wake of the "Golden Cell", the "Queen M" and of the other beautiful yachts of the Benetti "Golden Bay" series; she is based on the same design yet she features some innovations. Range: approx. 3,500 miles at 12 knots. For further information contact Benetti Yachts; via Coppino 104; 55049 Viareggio (LU) Italy; tel. +39 0584 3821; fax +39 0584 396232; e-mail: info@benettiyachts.it; website: www.benettiyachts.it. 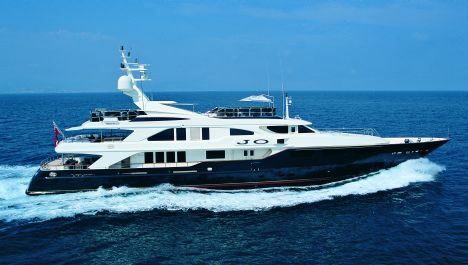 Just like another glamorous yacht of the above-mentioned series, "Jo" has a dark-blue hull, chosen by the Owner, as well as a superb outside line, designed by Stefano Natucci. François Zuretti developed the interiors satisfying the style requirements of the European Owner, who wanted a yacht for himself and for chartering. 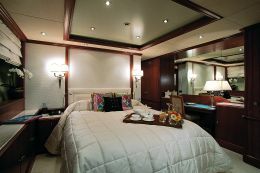 For this purpose the designer created six cabins for a total of 12 beds laid out as follows: one master stateroom, two double cabins, two twin cabins and an additional cabin that may be used for different purposes with two additional beds. The crew quarters - six cabins sleeping a total of 12 - are forward, separated from the Owner's and his guests' living areas. The yacht has three decks plus the sundeck. 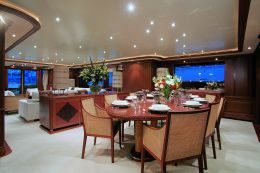 The lower deck is occupied by the guest cabins and crew quarters - cabins, dinette and salon. Each guest cabin is styled differently accordingly to the suggestions of the stylists Burberry, Ralph Lauren, Versace and Mulberry. 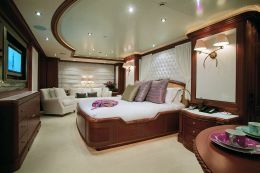 The main deck includes the salon and dining room amidships and the full-beam master suite forward. The master suite is set in a privileged position and is very ample so that the Owner can use it not only for sleeping but also per relaxing and working. For this reason there is a separated and fully equipped office, a relaxing corner with sofa and opposite, a small coffee table with two armchairs, a vanity and, in the center, a king-size double bed. The two bathrooms have separate bathtub and shower stall. 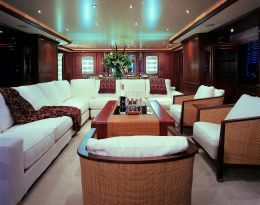 On this same deck aft, there are two open-air living areas protected by the upper deck: one with table and surrounding sofa and armchairs, and the other one, going forward, with a cocktail table and round sofa. The upper deck includes an open-air living area aft with semicircular sofas and tables with armchairs, plus a large table that seats 12 protected by the extension of the sun deck. Inside, there is an additional living area with bar, sofas and tables. This deck also includes the captain's cabin that is directly connected with the helm station. The latter takes up the whole width of the superstructure and is in a dominant position. 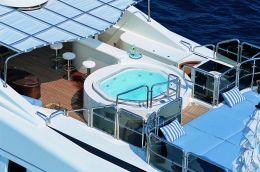 The sundeck is equipped for maximum comfort and relaxation: a round Jacuzzi pool, ample sunning areas, sofas and tables, a round table with surrounding sofa and armchairs and a bar counter with settees. 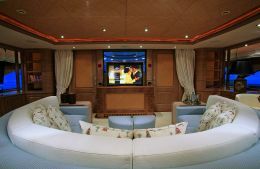 "Jo" is fitted with a modern and complex audio-visual system, which allows to watch hi- fi shows from all rooms and open-air spaces, thanks to the several large LCD screens - some of which are concealed when not in use - and to a 100-cd juke-box connected to a cable system. 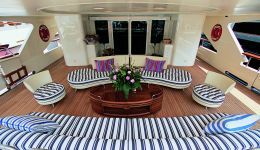 Of course, a yacht like this one, devoted to satisfying the wishes of her Owner and guests, is also equipped with auxiliary systems capable of offering different types of entertainment. The ample garage houses a custom-made tender with inboard diesel engine and water jet propulsion, a jet-ski, two kayaks and a small sailing boat, plus diving equipment or any useful gear for enjoying life at sea. Two additional jet-skis and a RIB are housed in the forward section of the hull. When the ample aft garage door is open it offers a very comfortable surface at sea level that may be used when the yacht is anchored. 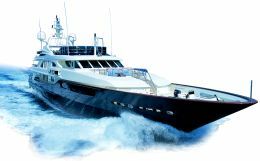 Another special feature, different from other yachts of the "Golden Bay" series, is the presence of a royal ladder to starboard, of underwater lights, of a boosted air-conditioning system and of an additional diesel tank aft. Construction material, as for all Benetti yachts of the same range, is stainless steel for the hull and aluminum for the superstructures. The yacht is classified with ABS Malta Cross A1 Yacht Service, AMS and MCA.